Our main technological expertise is in high content screening and analysis – a methodology that uses automated microscopy and image analysis to assess individual cells images to produce a large number of cellular measurements. This field is also known as quantitative cell biology or imaging cytometry. The goal of this process is to capture the complex phenotype of cells from various tissues, perturb them (with drugs, genetic manipulations, etc) and quantitate their change in phenotype. 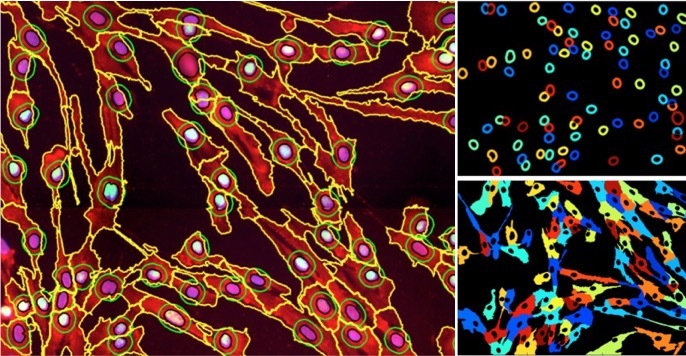 This field shows a color image of skeletal muscle cells after the cellular segmentation process using the open-source Cell Profiler software. Multi-color images are taken using a ThermoFisher CX5 high content microscope, then are segmented to identify the nuclei (circled in black), a peri-nuclear ring (green circles), and the cytoplasm (yellow outlines). Once the cellular compartments are delineated, we then make a series of measurements that include dye intensities, shape/size of the cells, and many many other features. This captures a comprehensive cellular “fingerprint” that can be used to detect meaningful biological change in the cell, as with the application of a drug with a therapeutic effect. Our mission is to discover and develop drugs for type-II diabetes, obesity and associated complications, especially for fatty liver disease and NASH. In vivo studies to evaluate the efficacy and drugability of small molecules for diabetes, obesity, NAFLD and NASH. 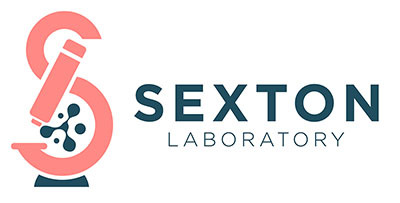 The Sexton lab performs medicinal chemistry optimization to develop in vivo probes and molecules with translational potential for treating diabetes, obesity and chronic liver diseases.